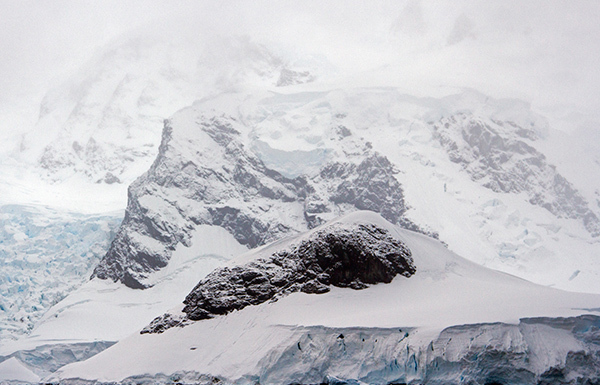 New Study: Is Antarctica Ice Sheet Instability Unstoppable? 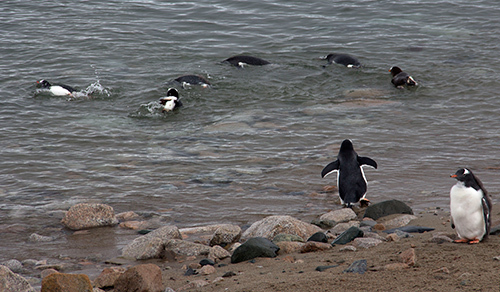 New Study Reports Antarctica Ice Sheet Instability, but Is It Unstoppable? The more we travel, the more we understand the connectedness of every spot on the globe. But even if our travels are mostly virtual, today—in our rapidly shrinking world—we know there’s a reason to care about what’s happening in places we may never see for ourselves. Right now, girls are disappearing in Nigeria, and that means that every girl everywhere could be a target. Rhinos and elephants are being poached at unprecedented levels in Africa and Asia, and it affects us all, as wars then escalate and biodiversity decreases. Sometimes, it seems a disappearing act is going on, planet-wide. More than our children and our wildlife may be vanishing, and we need to be concerned. 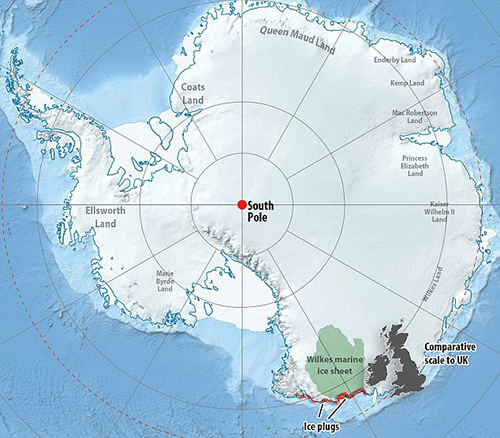 On May 4, 2014, the Potsdam Institute for Climate Impact Research issued a report on the ice sheet of East Antarctica. While the instability of West Antarctica has been in the news for some time now, this study is one of the first to gauge risks in the continent’s eastern section, an area that is 10 times bigger than that in the west. An “ice plug”—a small rim of ice resting on bedrock below sea level, which currently holds back the ice behind it—might melt away in coming centuries if ocean waters warm. So far, we haven’t been successful at completely stopping wildlife poaching or the loss of schoolchildren. Will we be able to stop the dissolving of an ice sheet and the mass flooding that will result? While the air over Antarctica remains cold, climate change’s warming oceans could cause ice loss on the coast. On May 4, 2014, a report published online in the journal Nature Climate Change stated that researchers using an under-the-ice ground profile of Wilkes Basin—which stretches more than 600 miles inland—and computer ice-flow simulations showed what would happen if the ice plug is lost. The results indicated that if the Wilkes Basin plug goes, it would destabilize the regional ice flow and lead to a self-sustained discharge of the entire basin and a global sea-level rise of nine to 13 feet (ultimately up to 80 times larger than the initial melting of the ice cork). For the next several thousand years, then, there would be a continual, unstoppable sea-level rise. The most perturbing finding of the study is that if set in motion, the ice flow would be irreversible. The good news, however, is that the region is not an immediate threat. The study indicated that it could take 200 years or more to melt the ice plug if ocean temperatures rise. And once removed, it could take another 5,000 to 10,000 years for gravity to pull all of the Wilkes Basin ice seawards. We have time to limit global warming to levels to keep the ice plug in place if we start now. Happily, almost 200 governments have promised to work out a United Nations deal by the end of 2015 to curb increasing emissions from manmade greenhouse gases that a U.N. panel says will cause more weather-related disasters, such as downpours, droughts, heat waves and rising seas. If we keep climate change a national priority, we may be able to stop at least one of our great losses, before more of our world evaporates. What do you think will result from a sea-level rise of even a foot? Read about the trend here, and then imagine your own scenario. Describe the new world that you see, below. Great insight Judy. As Einstien once said you can’t solve a promblem using the same thinking that created the problem. No one can think differant and year in year out nothing ever gets done to fix the issue. What no one ever mentions is that the water from the melting ice at the poles goes to the equator because the earth spins. All that extra weight of the water at the equator puts completely different pressures on the earth’s crust, which will likely result in violent volcanic eruptions. Major volcanic eruptions will displace and kill huge numbers of people and other animals. Not that melting ice and sea level rise isn’t bad enough. The question is why are we standing around wringing our hands rather than leaving the coal in the ground. Sure the global economies would have to pay a little now, but it seems like a small thing compared to the cost of rising sea levels, volcanic eruptions, more violent weather and worse wildfires. But that is just my view, not the majority of the people, obviously. Time to join an Earth Bereavement Support Group! From my limited knowledge, I can tell that even a rise of a 1-2 feet would lead to a world of significant devastation and displacement. Not to mention the impact lowering the salt level of the water would have on climate. Having said that, I’m quite sure that I’m understating it.